As a small arms instructor and range safety officer, I frequently see AR platform rifles lock up using steel cased ammo. Many think it is due to lacquer or ploymer on the case to prevent rust gumming up a hot chamber. But is that really the reason? And will steel cased ammo really damage your AR? There are two “accepted” points of view in regards to shooting steel case ammo in AR platforms rifles. The first is that it will damage the chamber and extractor, and the second is that stuck cases in chambers are the result of lacquer coating on the cases getting hot, and sticking to the chamber walls. Since I don’t run the AR platform, preferring the AK, I never really paid a lot of attention to these issues until recently. However, I had always wondered about these issues since steel cased ammo has been used for a long time around the world, so I decided to do some research as I plan on buying an AR platform rifle for business purposes. The Germans began using steel cased ammo at the beginning of WW2 due to difficulty in securing enough copper to make brass. It was also lacquer coated to prevent rust on the cases. This ammunition functioned perfectly in their weapons from climate extremes of North Africa to the frozen Russian front. Nor did they seem to have a parts breakage or wear problem using it.So lets look at the two issues separately. To me, this is pretty simple. Wear is a function of a harder surface contacting a softer surface. The steel used in steel cased ammo is a pretty soft steel while the steel used in rifle barrels and parts is much harder. I honestly do not believe that running steel cased ammo through your AR is going to cause any extensive additional wear or damage. The problem primarily seems to be using Wolf manufactured 5.56mm cartridges in AR series rifles. I have shot a tremendous amount of steel cased, lacquer coated 7.62×39 and 5.45×39 ammo through Aks and CZ-58s to where the barrels were hot enough to light a cigarette on, and after inspecting the spent cases, the only damage I saw to the lacquer was the scratches caused by ejection. The lacquer showed no signs of melting and coming off the case. In addition, Wolf no longer coats steel cases with lacquer, having switched to a polymer coating, yet Wolf manufactured (and others) steel cases still will lock up in AR rifles. So what gives? There are a number of concurrent issues involved. 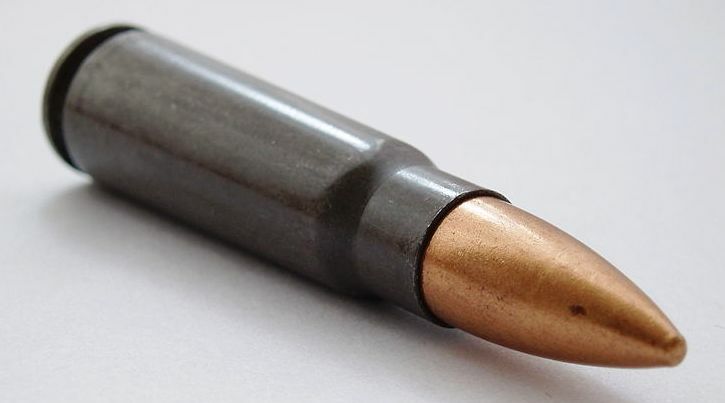 To understand whats going on here, you have to understand the different characteristics of steel and brass cartridge cases. When a cartridge is fired and the pressure builds inside the case, the case wall expands against the chamber forming a seal preventing the gas from flowing back inside the action. Brass is much “springier” than steel and expands better forming a better seal. Steel cases often do not expand as well, and allow a certain amount of gas back into the chamber causing an increase of carbon build up in the chamber. Then, when a cartridge does expand properly, it can lock in the chamber due to excess carbon.This is not a problem with weapons designed around steel case ammo such as the AK series weapons with looser chamber tolerances, but with most AR’s the tolerances are tighter and this increased carbon build up is a factor. I volunteer often as a range safety officer at the range I teach at, and every time I have seen a steel case lock up in an AR chamber, there was one common denominator: The rifle was bone dry with no lubricant, and extremely dirty. Many new AR owners are not aware of the lubrication required on this rifle, especially the bolt carrier group, and shooting them bone dry can be a serious factor in malfunctions, including stuck cases. You should use a good quality synthetic lubricant. If you want to read a really good article about a serious test between steel and brass case ammo, check out this article on Lucky Gunner. Steel case ammunition will not wear out your AR faster than brass case ammunition. It is not lacquer or polymer coating on steel cases that is causing stuck cases. It is the increased carbon build up with steel case ammo. So if you are running an AR series rifle and want to take advantage of the cheaper steel case ammo, what do you do? Keep your rifle clean. You should give it a good cleaning every 500 rounds or so. Keep your rifle well lubricated. You may find that your particular AR will simply not efficiently digest steel case ammo in which case you will need to feed it brass cased rounds or another option such as zinc coated steel. This was years ago, I was 20 at the time, I encountered this problem on 2 different fronts, steel case .223 in a Golani Rifle, and steel case .357 in a revolver. I would get a stuck casing in my Golani every round. Lubricated my rifle, and it would fine for 1 magazine before stuck casings again. I remember from a documentary on Japanese and German firearms, especially with the Japanese that some of their older machine guns in WWII there were oiled brushed built into the gun, that would oil the casings before the round was chambered, to reduce malfunctions in their older machine guns. So, I did the same thing, I lubricated the cases on my steel case .223 with Rem-Oil, loaded up and shot. Never had a stoppage after that, or a stuck casing. Happens again later on, cheap steel case .357 magnum rounds in my revolver. After shooting a cylinder, could not extract the steel casings easily. a couple taps with a wooden object to extract the casings. Did the same thing again, lubricated the casings on the steel case ammunition. All the rounds extracted like brass and without a problem. That is interesting, and I have never heard of anyone doing that. Keep in mind though, that the Italian and Japanese weapons you are referencing were designed that way. The designs did not have a method of delaying initial extraction, and the swipe of oil caused that to happen. Delayed initial extraction allows the case to stay in the chamber until the pressure drops enough for the case to be extracted without ripping the case head off. The oil causes the case to seal against the chamber wall for the chamber pressure to drop enough for the case to be easily extracted. For modern weapons like yours, the design allows for delayed initial extraction, and putting oil on the cases raises the chamber pressure some. Just be careful. I have personally had issues with the wolf polymer coated ammo in AR-15 rifles. The issue for me was the polymer coating the chamber when the rifle got hot. Lots of problems cleaning the chamber of that gunk, to the extent that I abandoned using that particular ammo. Using the non polymer coated ammo created no issues for me in the ARs that I was using at the time. Thank you for your time to comment on this article. It is an older article that still gets a lot of hits through internet searches as this is still a controversial subject. I have had many comments on it , pro and con, one commenter stating that this article was based on “guesswork”. Yea, about a half a century of carrying and using military small arms from all the major nations. Sometimes in combat, sometimes in peace. I investigate. I don’t guess. Since I wrote this article I have acquired an AR platform rifle which I have tested a number of concepts on. It eats anything I feed it, as long as I keep it properly lubricated. EVERY AR that I had to clear on a range because of a stuck steel case was bone dry. One thing I tried to point out is that originally, this ammo was lacquer coated which caused immediate problems with ARs and then Wolf changed to polymer. Due to the variances of chamber dimensions from different manufacturers some ARs can do well with steel case and some don’t. It is a matter of luck of the draw perhaps. Every AR owner should test his rifle diligently to know what it will digest. Again, thak you for your comments. I have personally had this problem. I had to clean the chamber with a .30 cal brass brush on a cordless drill. I removed very large plaques of yellowish plastic like coating from the chamber. Afterwards I shot more to warm up the chamber and ran a bore snake through. I could feel stickiness on it.